Is Super Smash Bros. All Tapped Out? If there’s anything that has come to define Super Smash Bros. over the years, it’s the all-star line-up of beloved Nintendo icons comprising its roster and playable stages. The most fun thing about the series is not only pitting your favorite characters from your favorite games against each other in battle, but also unlocking them through hard work, sore thumbs and sheer determination. It’s always been a delight to see who or what will show up next. I’ve been playing the games since the original came out in 1999 and it’s been a trip seeing how big that roster has gotten over the years. But this time, I have to wonder if Nintendo’s rehash approach to the Switch, which has shown up in games like Mario Kart 8 Deluxe (which repackaged the game with improved graphics and included all the DLC content), influenced the development of Super Smash Ultimate. Over the past few weeks, as I’ve worked my way through the VS. mode to unlock new fighters, it seemed like I’d already experienced everything. Within the first three rounds, I was struggling to find a stage I hadn’t already played and while over the years I’ve put enough time into the series that I’ve played all the fighters in Ultimate, somehow the roster, even with its abundance of familiar faces, seems less disappointing. Is Nintendo finally hitting the limit of what they can mine from their intellectual properties? The answer to that may be a matter of presentation and perspective. I think the element of unlocking content has always felt like unwrapping gifts at Christmas and I miss that excitement. But let’s break it down by numbers. The original Super Smash Bros., which was actually criticized for not having enough content, had 12 total fighters and nine stages, only a few of which were unlockable. Melee followed up by doubling the available characters and upping the number of stages to 29, with about half unlockable. For Brawl, the roster totaled 39 fighters with about half unlockable, and 41 levels, with 31 original and 11 unlockable. The base version of the fourth Super Smash Bros. had 58 characters with 21 original and about 12 unlockable (8 for Wii U); there were 42 stages in the 3DS version with 30 original and 7 unlockable, and 55 stages in the Wii U version with 34 new and 6 unlockable. 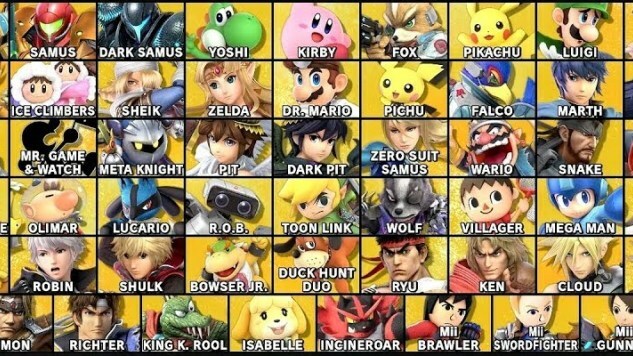 In Ultimate, all 63 characters from the previous games return, with 11 new fighters—half of which are Echo Fighters, duplicating other characters—for a total of 74, with only the 8 original Smash fighters available at the start. And there are 96 returning stages, with 7 unlockable. It would seem that at the very least, Smash does have the least amount of new content yet. The numbers are a bit much but they do indicate that Nintendo has reached a peak when it comes to the bulky new roster and stage additions. And while it’s true that Smash at this point no longer needs to mine every last series and IP for new content, given how many of even the few new characters tread old territory (do we really need four, functionally identical characters from Fire Emblem? ), I wish they would. It’s boring not having more surprises and mini-goals to get me through long bouts in VS. mode. It was a mistake not to thread the unlocking experience with more new content. It may not be that Nintendo is all tapped out for Super Smash Bros., but rather, that the stages, like the roster, need to be incrementally rewarded. All the same, it would be nice if the latest Smash game were a better balance between past and present. While it’s kind of cool that Ultimate features every stage and character from the series, Nintendo seems to forget that we’ve been playing those for years and still need something new. A better approach might have been to offer the new content upfront, and make the legacy fighters and stages unlockable, both providing a fresh experience towards the beginning of the game and reinforcing the air of forbidden mystique around the past content. Smash is at its most fun when there’s a sense of surprise and revelation, and it’s hard to achieve that in a game where all 96 repeat stages are dumped on you at once. But as it stands, right now Ultimate feels like too much of a good, old thing. Nintendo is starting to build itself a reputation for repackaging old games for its new system, and this does not help Smash with its familiarity problem. It might not be fully tapped out just yet, but it’s definitely drying up.